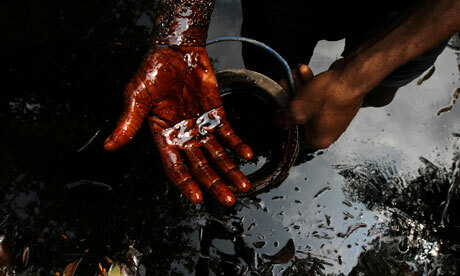 Shell oil activities in Ogoniland in the Niger delta have polluted rivers. Shell has never denied that its oil operations have polluted large areas of the Niger Delta -- land and air. But it had resisted charges of complicity in human rights abuses. In 2009, in a New York federal court, that evidence never saw light during the trial. Shell had been accused of collaborating with the state in the execution in 1995 of writer Ken Saro-Wiwa and other leaders of the Ogoni tribe. Instead, Shell paid $15.5m ( -9.6m) to the eight families in settlement.